Ever since I was little I was always a fan of Nintendo's Punch-Out!! 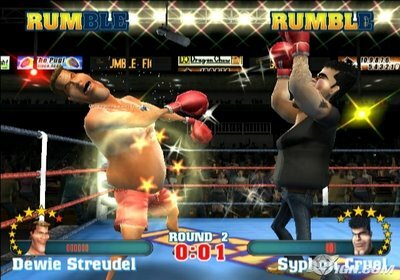 There is a remake in the works or just recently out but another great title in the small but loved boxing game genre is Ready 2 Rumble. I remember back when I worked at Kay Bee Toys in 2000 and getting the game for Christmas since it was bundled with my brand new Playstation 2. Some can argue that it wasn't the greatest boxing game but for many gamers who then didn't see a boxing game since the good old days of Punch-out, it was a warm welcome. A roster of 18 wildly caricatured cartoony boxers, all parodies of celebrities from the worlds of sports, music and movies who enter the ring as larger-than-life "Rumble-ized" versions of themselves. Players will step right up and see if they can knock these super-sized egos down a peg or two! Hosted by "The Voice of the Champions" Michael Buffer, famous for his "Let's Get Ready to Rumble" trademark call. Characters are brought to life with hilarious moves, detailed facial animations, damage textures and fighting techniques including special moves, combos, extreme knockdowns and special "Rumble" combos. An all new Championship Mode lets gamers create their own unique boxer and nurture his skills through mini-games, developing him as a fighter and creating a completely personalized Ready 2 Rumble Revolution experience. Delivers a fun and intuitive experience in either single player or multiplayer mode. The Wii controllers provide would-be pugilists with an intuitive and realistic feel. 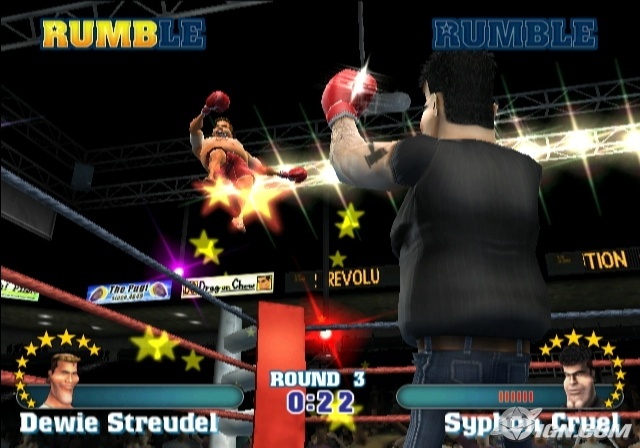 Using the Nunchuk controller as one glove and the Wii Remote controller as the other, players dodge, weave and throw the big punches to KO their opponents. More info on gamespy as well. Click the item below to get a sneek peek at this title.